Het resultaat was een motor die meer dan 2000 toeren per minuut kon draaien, minder brandstof verbruikte en meer vermogen gaf dan zijn voornaamste concurrenten, een lager zwaartepunt mogelijk maakte door de kortere motor en een droge smering (dry sump principe). Dat alles maakte het een formidabele auto die bijna onklopbaar was. Dit model en zijn varianten ervan wonnen 15 van de 19 Grand Prix's in 1912-1914. Uit de L76 kwamen nog een aantal andere varianten voort met verschillende zuigerverplaatsingen. Het palmares van deze varianten tussen 1912-1914 was ronduit indrukwekkend. Behalve dat ze domineerden in de Grand Prix's, wonnen deze wagens the Indianapolis 500 in 1913, 1916 en terug in 1919 en dat terwijl de winnende wagen al 5 jaar oud was. Gelukkige 100ste verjaardag voor de Grand Prix Peugeot!! Met dank aan Mike Tippet van het Australische Peugeot forum voor het opstellen van de originele tekst. Een speciale aangepaste aerodynamische versie genaamd La Torpille (de torpedo) heeft snelheidsrecords gebroken. Voor de Indy 500 in 1913 was de Peugeot 13 minuten voor op zijn tegenstanders. Historiek met de L76 en L45. 4 kleppen per cilinder, de Peugeot L76 (7600cc) was er van voorzien in 1912 en hij won de grote prijs van Frankrijk, alsook in 1913 als eerste Europese wagen de Indy 500, ook al was de motor klein vergeleken met zijn rivalen. De volgende jaren veranderde echter de reglementen en mochten de wagens max 4500cc hebben met een max gewicht van 1100kg, dus de naam veranderde naar Peugeot L45, 112pk braakte hij uit bij 2800rpm. In 1916 was het opnieuw raak in de Indy 500. Omdat de Peugeots die in de VS reden niet meer terugkonden verscheept worden wegens het oorlogsklimaat in Europa (Wereld Oorlog I van 1914 tot 1918) wist men ginder niet goed wat men met de auto's moest aanvangen. Uiteindelijk zijn die overgekocht geweest door Offenhauser welke zeer onder de indruk was van de motorkarakteristieken. Op basis daarvan heeft hij zijn eigen afgeleiden ontwikkeld welke bekend waren voor hun grote performantie alsook betrouwbaarheid. Offenhauser's motor had namelijk geen cilinderkop waardoor hij met compressies kon werken van 15 op 1. De koploze motor had dan ook geen last van lekkende koppakkingen. In a dual overhead camshaft engine, the cams operate on inclined valve stems directly or through interposed cam followers. The intake and exhaust valves are disposed through an intermediate angle that minimizes intake and exhaust flow restrictions. Combustion chamber shape can be tailored to fuel quality, spark plug position and combustion propagation. It is the accepted standard for extracting performance and economy in internal combustion engines. Today virtually every racing engine uses dual overhead camshafts. At the other end of the internal combustion engine spectrum, high efficiency road engines, even hybrids, use them to maximize recovery of the innate energy of hydrocarbon fuels. All dual overhead camshaft engines trace their origins back to a few Peugeots built a hundred years ago by a trio of racers, Jules Goux, Georges Boillot and Paolo Zuccarelli, and their engineer collaborator Ernest Henry for Peugeot. The race cars they built had several variations to comply with changing regulations, but today only two examples of these pioneering cars exist. This is one of them, while the other has a secure position in a Florida collection. The Lindley Bothwell Peugeot L45 has a clear, unambiguous history of owners, from Peugeot through owners Lutcher Brown and Frank Book, and drivers Ralph Mulford and Arthur H. Klein to Lindley Bothwell. It is the original 4½-liter chassis, numbered "1", and the original engine, also numbered "1". In other words, it is the real deal, the genuine article, with no gaps in its hundred-year history. It has never fallen into disrepair nor been ignored. The center of the automobile industry in the early 20th century was France. It had more serious automobile manufacturers than the rest of the world combined. Its technology was the most advanced, its engineers the most educated, its factories the best equipped, its road network the finest in the world, and the first automobile races, held on city-to-city routes over open roads, were held in France. In 1906, The Automobile Club de France (ACF) succeeded the Gordon Bennett Trophy with the first Grand Prix. Held on a triangular circuit near Le Mans, it was won by Ferenc Szisz on a 13 liter 90hp Renault AK. 1907 was dominated by Felice Nazzaro driving another monster, a 16.3 liter 130hp FIAT. Engine size restrictions were introduced by general agreement in 1908, and now it was Christian Lautenschlager on a 13.5 liter 135hp Mercedes who won the ACF Grand Prix on a new triangular circuit based in Dieppe. After a two year hiatus, the ACF GP was renewed for 1911 on the Dieppe course where Louis Wagner's 14.1 liter FIAT was outclassed in the two-day event by a newcomer barely half its size. Georges Boillot drove a revolutionary 7.6 liter Peugeot, the first of the "Charlatans" dual overhead camshaft revelations. It was a turning point in automobile history, especially as teammates Jules Goux won the Grand Prix de France and Paolo Zuccarelli was victorious in the Sarthe Cup. The origins of the L76 Peugeot have been shrouded by the passage of time. Some attribute the design to Swiss engineer Ernest Henry. Others believe it was Paolo Zuccarelli, who had worked with Mark Birkigt at Hispano-Suiza. No matter: it was a collaboration among Boillot, Goux, Zuccarelli and Henry that achieved a historic breakthrough. In The Classic Twin-Cam Engine, historian Griffith Borgeson speculated on the early history as the collaborators convinced Robert Peugeot to fund the development of their radical design in a separate workshop apart from Peugeot's engineering and design office, recently reunited with its cousins at Lion Peugeot. The Peugeot establishment scoffed at the group working by themselves at Suresnes and referred to them derogatorily as "The Charlatans". The L76 Peugeot four set the automobile world on its ear, a car that Lawrence Pomeroy called "of startling technical novelty". A conventional but lightweight chassis had shaft drive, a 4-speed gearbox and the L76 engine. A four-cylinder, it had a single piece cast iron cylinder block with integral cylinder head bolted to a horizontally split alloy crankcase and an aluminum wet sump. The crankshaft was supported by five plain main bearings and was offset from the centerline of the cylinders, an arrangement thought at the time to reduce side loads on the pistons. The offset crank is characterized by clearance channels cast into the cylinder block on the intake side. It was the valve gear that caused the world to take note. The dual overhead camshafts were contained in separate aluminum sleeves, supported off the head by the timing gear cover and pairs of pylons. The main valve springs were placed between the cam sleeves and the head, their exposed location aiding cooling and minimizing oil seepage from the pressure lubricated camshafts to the cylinder head valve guides. There were four valves per cylinder each with its own stirrup-type cam follower that both opened and closed the valve, effectively a spring-augmented desmodromic system. Camshaft drive was by a vertical shaft and bevel gears. The valve stems were angled to create a pent-roof combustion chamber and minimize changes in direction of the intake and exhaust gasses with two intake ports each serving a pair of cylinders and four large rectangular exhaust ports. Later Peugeots would benefit from experience with the L76 and continuously improve in both specific output and reliability. A smaller L56 Peugeot was built in response to the ACF's fuel consumption limitation in 1913 and it was even more advanced than the L76. The L56 did away with plain main bearings, in fact it did away with two of the five bearings and went to ball bearings, single row at the front and the center positions and double row at the rear of the counterbalanced 2-piece crankshaft. The crankcase was a single piece alloy barrel with the center ball bearing supported in its full circumference by a bronze web that was inserted into a heated crankcase which then contracted to an interference fit. Lubrication was now – and probably its first appearance ever – by a dry sump system. The camshafts now were driven by a chain of spur gears in a compact housing at the front of the engine. The stirrup cam followers of the L76 were replaced by L-shaped followers between the cam and the valve stem. Highly unusually for the times the intake valves were larger than the exhausts, another prescient development that continues to the present day. This became the definitive form of The "Charlatans" four-cylinder engine. 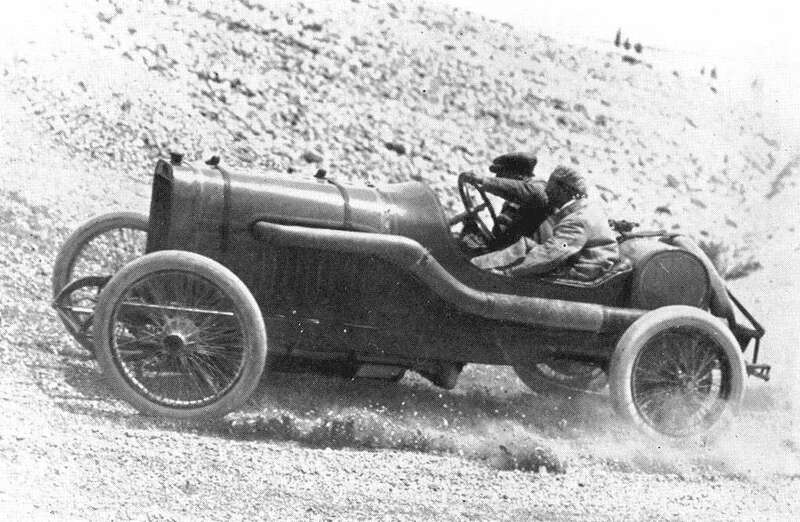 The 1914 ACF Grand Prix was held on a new circuit near Lyons, 20 laps of a 37.6km circuit on July 4, a few weeks before the start of the First World War. The ACF had again changed the rules, limiting displacement to 4.5 liters. Peugeot's entry was, accordingly, a team of three L45 cars with a spare. The engines were essentially the same as the L56 with reduced displacement, but there were improvements to the chassis including four-wheel brakes and new Rudge centerlock wheels with winged securing nuts. The latter are thought to have been a Georges Boillot innovation, that could be removed and attached more quickly with a hammer. The Peugeots' bodies were modified with long, tapered tails carrying two spare wheels and tires vertically under a hump. The team was led by Georges Boillot backed up by Jules Goux and Victor Rigal replacing Paolo Zuccarelli who had died in a practice crash a year before. The four-wheel brakes were effective and the quick change wheel nuts proved to be of immense value as Peugeot's tires were not up to the sustained high speed running and cornering. Their competition was a five-car team of Mercedes with single overhead camshaft four-cylinder engines, a team of experienced, dedicated drivers and the kind of organization for which Mercedes was justly famous. Nearly every marque in the Grand Prix now had overhead camshaft engines, some single but others double in the Peugeot pattern. An epic battle ensued as Mercedes' driver Max Sailer drove ferociously in an attempt to wear out the determined Boillot dogging his heels. 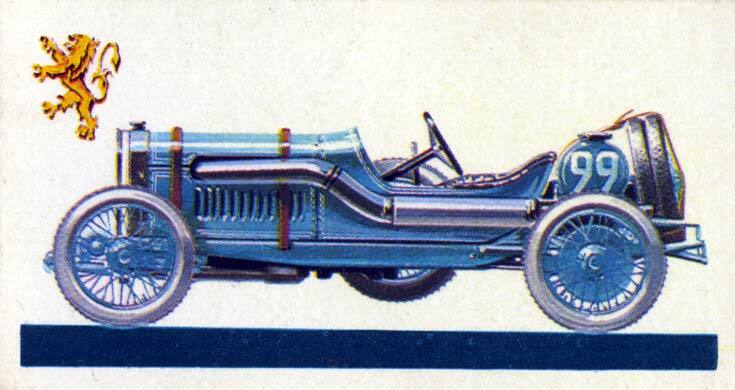 When Sailer's thrashing of the Mercedes sent a connecting rod sailing, Boillot moved into the lead, pursued by a horde of Mercedes and the Delage (an artful reimagining of The Charlatans' Peugeot) of Leon Duray. Boillot led the middle half of the race, despite changing tires at twice the rate of the Mercedes of Christian Lautenschlager who was steadily eating into Boillot's lead. He eventually passed Boillot on the penultimate lap and the Peugeot star succumbed to a dropped valve (or a broken rear axle, depending upon the source) before reaching the finish. Mercedes finished 1-2-3 with Jules Goux fourth and Rigal seventh in the remaining Peugeots. The 1914 ACF Grand Prix at Lyon is generally considered to be the most exciting race of its era and Georges Boillot's performance an epic of skill and determination. Shortly after, war broke out, effectively ending racing in Europe "for the duration." The Peugeot L45s, though, had further glory in their futures. 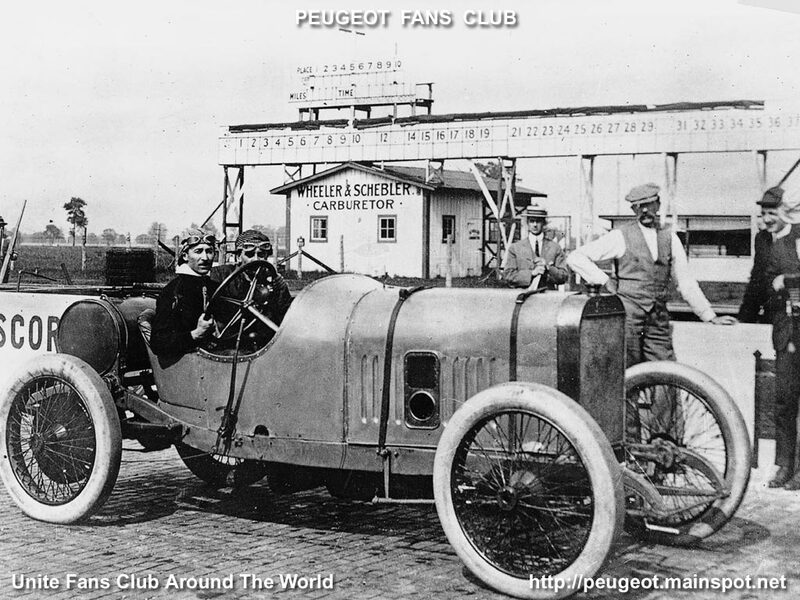 In 1913, Peugeot sent a two-car team to Indianapolis for the 500 mile Sweepstakes, at the time far and away the richest race in the world with a guaranteed purse of $50,000 and $20,000 for the winner. The L76-based Peugeot Indy cars were reduced in bore and stroke to 449 cubic inches to meet the Speedway's 450 cubic inch displacement limit. Paolo Zuccarelli dropped out after only 18 laps when a main bearing failed, but Jules Goux, relying on advice and coaching from American veteran Johnny Aitken and six splits of champagne provided by fans from the Alliance Français, drove a perfectly calculated race. He took home not only the first-place money but also the trophies for leading at 200, 300 and 400 miles. It was a clean sweep, and the American racing community noticed. The Peugeots returned in 1914 with a pair of L56s for Boillot and Goux. Arthur Duray brought a privately owned L3, the revised 3-liter Coupe de l'Auto competitor. Boillot set the fastest time in pre-race qualifying, turning in a 10-lap average of 99.85mph. Goux was only a few ticks of the watch behind with the second fastest average, 98.13mph while Duray averaged 90mph. The European racing community had sniffed the aroma of money from middle America and attended in force: Delage, Sunbeam, Isotta-Fraschini, Bugatti and Excelsior. At the finish, the top four places were taken by French entries with Rene Thomas in a Delage taking home the big prize followed by Arthur Duray's 3-liter Peugeot, Albert Guyot's Delage and Goux's Peugeot L56. Boillot's Peugeot crashed on lap 141 while running third and threatening for the lead. In January 1915 Bob Burman destroyed the engine of his Peugeot L56 in a race at Point Loma (San Diego), California. Peugeot declined on account of the war to provide a replacement. Burman turned to Harry Miller in Los Angeles, then the ranking genius in racing engine carburetion, not only to repair the bits and pieces of his shattered Peugeot but to configure it to the new 300 cubic inch limitation. In the process of doing the almost-impossible – delivering a competitive 300 cubic inch engine to Burman in time for Indianapolis – Miller and Fred Offenhauser succeeded also in examining the innermost workings of the Peugeot L56. A 50-year history of Miller, Offenhauser and Meyer-Drake dual overhead camshaft engines followed. The onset of hostilities in Europe also presented a problem for Carl Fisher and the Indianapolis management, some of it their own doing with the reduced 300 cubic inch displacement limit. The race, however, proved to be compelling. Ralph DePalma in a Mercedes and Dario Resta in a Peugeot waged an exciting seesaw battle from the 80th lap until, with 165 miles to go, Resta encountered a steering problem and backed off to preserve second place. DePalma continued only to launch a connecting rod through the crankcase with three laps to go. Far in the lead, DePalma slowed, finishing the race three and a half minutes ahead of Resta while running on three cylinders and no oil. Continuing war in Europe and escalating war production opportunities in the U.S. drastically reduced the potential entry for the 1916 Indianapolis 500. Promoter Carl Fisher rose to the challenge by canvassing Europe for available competitive cars, but could come up only with two Peugeot L45s. One of them probably was the 1914 Lyon Grand Prix spare. Desperate for more entries, Fisher engaged the Premier Motor Car Company, only recently reorganized from bankruptcy, to build three Peugeot duplicates. The 1916 Indianapolis Sweepstakes reduced the race distance to 300 miles. Three Peugeot L45s were entered. One, ostensibly entered by the "Peugeot Auto Racing Co.", was driven by star Dario Resta. Another was entered by the "Indianapolis Speedway Team Co." for Johnny Aitken, Jules Goux's 1913 Indianapolis coach, along with the Premier replicas racing as Peugeots. A third was privately entered by driver Ralph Mulford. Mulford's car is understood to have been owned by Lutcher Brown, a timber baron, who on September 11, 1915 is recorded in 'The St. Louis Lumberman', as leaving for New York 'to prepare his new Peugeot racing car for entry in the Sheepshead Bay races on October 2nd. ', for which he had paid the considerably sum of $10,000. Mulford was slated to drive then, with Jimmie Stakes as mechanic. Which car was which? The 1914 Peugeot Lyon Grand Prix spare is visually distinguished from its three counterparts by one subtle detail: hood side louvers that are shorter than the other three cars. A photo of Mulford's car a Sheepshead Bay and perusal of the official Indianapolis race entry photos shows that his 1916 Indianapolis Peugeot L45 has the same short hood side louvers and was almost certainly the 1914 Lyon Grand Prix Peugeot spare team car. Mulford brought it home third overall behind Resta's Peugeot and Wilbur D'Alene's Duesenberg. In March 1917, Ralph De Palma stated in that year at Indianapolis he would campaign the Peugeot which he had just bought from Lutcher Brown. There was to be no race that year afterall, but this seems to be the point at which it passed from Brown to De Palma's backer Frank P. Book, one of a trio of brothers who were wealthy Detroit Property entrepreneurs and are today immortalised by the Book Tower and Buildings in that city. Book had previously funded De Palma's purchase of the 1914 Grand Prix de Lyon Mercedes, which had run at Indy in '16. Racing at the Speedway ceased upon the United States' entry into the war but was resumed quickly in 1919. Georges Boillot had been killed in a dogfight over Europe, and Johnny Aitken had died in the 1918 influenza epidemic but Carl Fisher invited Jules Goux to return to the Speedway in 1919 to take charge of preparing the Speedway's Peugeots and their clones, the Premiers, and to drive one of the Speedway's Peugeots. Goux personally entered another Peugeot of 2½ liters for Georges Boillot's younger brother, André. Goux lost the engine in his Peugeot in practice on the final day of qualifying and rushed to fit one of the Premier-built Peugeot clone engines, taking to the track in the final minutes of the last session and posting a 95mph lap to qualify 22nd after only a single warmup lap. The quick engine change shows how accurately Premier had replicated The Charlatans L45 in nearly every detail. Contemporary press reports confirm that for 1919 Frank Book was keen on a serviceman driving his car, and handed the drive to Art Klein, an Indy veteran and now Lieutenant who was fresh from Issodun in France, where he had charge of the largest group of Liberty engined planes in foreign service. Klein would sport the blue and maize colors of the Detroit Automobile Club, and the Peugeot would also wear a DAC badge on its radiator grill. Book had hedged his bets with a second entry, a 'Detroit Special', built by the De Palma Manufacturing company which he also funded. In the race – held on Saturday May 31 to avoid conflict with the first Decoration Day commemoration following the carnage in Europe – the early pace was set by Ralph DePalma in his Packard V12, followed respectfully by Earl Cooper's Stutz, Howdy Wilcox in one of the Speedway's Peugeots and René Thomas's Ballot. DePalma pitted for repairs on lap 103 and was replaced as leader by Wilcox in the Peugeot, a position he would hold until the finish where he was followed by Eddie Hearn's Stutz and Jules Goux in the Peugeot/Premier, adding further laurels to the Peugeot Lyon GP cars' successful record. Sadly, Art Klein in this Peugeot had to retire in 19th place after breaking an oil line on lap 72. Klein raced the Peugeot again during 1919 in the Elgin, Illinois Road Race August 23, in Uniontown, New Jersey on September 1, at the September Sheepshead Bay board track (finishing 4th), on the Cincinnati 2-mile board track October 12 (finishing second to Joe Boyer's Frontenac), ending the Championship season in 11th place. It is believed that after Indy, Book sent a team of three cars west and that the Peugeot was once again seen in action at Beverly Hills in 1920 on the 1¼ mile Beverly Hills board track. After this the Klein would pilot a Frontenac. Both international and Indianapolis regulations changed for 1920, again reducing displacement to 3-liters. The Charlatans leader Georges Boillot and Paolo Zuccarelli had died. Ernest Henry was with Rene Thomas at Ballot where he designed a brilliant dual overhead camshaft straight eight. Only Jules Goux remained loyally at Peugeot where his family had been employed for generations. Peugeot came up with an even more wild idea, a 3-camshaft, 5-valve per cylinder 3-liter four. It was a disappointment. For a while the L45 was mothballed only to reemerge in 1923 the hands of another Detroit tycoon, Joe Boyer, in the AAA dirt championship. There in a select series of four races over the summer months, at Toledo, Ohio, Danville, Quincy, and Chicaco, Illinois, the Peugeot contested against the 'usual suspects' - two Frontenacs, with shared drives by Resta, Chevrolet and Wilcox, De Palma's Double Overhead Cam 183, and Leon Duray's Miller 183. Ralph de Palma took the laurels, with Boyer second in that championship, the Peugeot still wearing race no. 29. It is thought that throughout this period Frank Book remained the owner of the car, and that after Boyer's death later that year, Klein took over ownership of the Peugeot. Sources differ on this aspect, but Klein was certainly known to have been very close to and well liked by the Book family, and Bothwell notes are quite clear that their acquisition was made from Klein, rather than Book. Art Klein kept the Peugeot for years and eventually became head of transportation for Warner Brothers Studios in Burbank. Slowly, as so often happens with race cars, the other Peugeots – and there was no small assortment of them in the U.S. – disappeared until Art Klein's became the sole survivor of the 4½-liter L45. Lindley Bothwell's collection, already one of the best in the country, had marvelous cars, but there in the San Fernando Valley just a few miles from the Bothwell Ranch resided in nearly pristine originality the absolute paragon of early race car design. Because, after all, what is to be done with a thirty year-old race car? Lindley Bothwell knew, as he would soon show. It is believed that he repeatedly asked Art Klein to let him add the 1916 Indianapolis 500 Peugeot to the growing Bothwell Collection. Art repeatedly demurred. In the late 40s, a fire at the Bothwell Ranch consumed many of the carefully collected, preserved and maintained cars in the Bothwell Collection, and this event is believed to have softened Art Klein's resolve. He eventually agreed to sell his Peugeot to Bothwell for $2,500 on February 11th, 1949, an important step forward to start rebuilding the collection. Although it has been known since then as the Dario Resta 1916 Indianapolis winner, it is in fact – as shown by the photographic evidence – the 1914 ACF Lyon GP spare driven to third place by Ralph Mulford at Indy in 1916 and raced by Klein at Indy in 1919. Its survival in original and largely untouched condition, with its original chassis, engine and body, is nearly miraculous. Examining it is to be transported back in time with construction and bodywork details completed at Peugeot in Suresnes in 1914. The tapered tail has two covers, a smooth one used at most U.S. races and the original Lyon GP tail with the hump for two vertically stored spare wheels and tires, found in a loft of the Bothwell Ranch buildings by Lindley Bothwell's grandnephew John Bothwell and reunited with the car. It is one of only two surviving Charlatans Peugeots, and the only one with Grand Prix history. After receiving it in early 1949, Lindley Bothwell registered it with the AAA Competition Board, prepared it and took it to Indianapolis where he put it on the track and lapped the Brickyard at 103.24 mph, decisively quicker than the experienced Johnny Aitken's 96.7 mph fastest qualifying speed in another Peugeot in 1916. The engine was rebuilt since 2000 and demonstrated its performance in the Goodwood Festival of Speed hillclimb twice, in 2003 and again in 2011. It was an unjudged special exhibit at Pebble Beach in 2014. It is still capable of over 100mph performance, but more than that, it is a singular example of the pioneering vision of The "Charlatans": Georges Boillot, Jules Goux, Paolo Zuccarelli and their gifted collaborator Ernest Henry who conceived the dual overhead camshaft engine. Henry Ford's Model T put the world on wheels but twenty years after its introduction none of its technical characteristics were reflected in the popular automobiles of the day. The Model T was by 1927 an anachronism. Not so the Peugeot/Mulford/Klein/Bothwell Peugeot L45, which based a lineage that still exists today in everything from Formula 1 to economy hybrids. als je ziet dat daar nu nog steeds technologie van wordt gebruikt. Zijn tijd ver vooruit.